Phew….I’m back! Sorry friends, after an exhausting six weeks completing my Modern Industrial Bedroom for the One Room Challenge, I took a few days off to get my life back together. Now that I’m back to the real world, I came to the realization that we only have a month until Father’s Day! Now… if the men in your life are anything like my husband or father… than they don’t really care all that much about homemade gifts, lol. BUT I like making them. 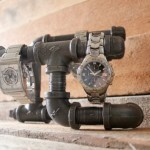 I figure if I can make things that are practical, meaningful, or totally awesome (& frugal! ), then they won’t mind. 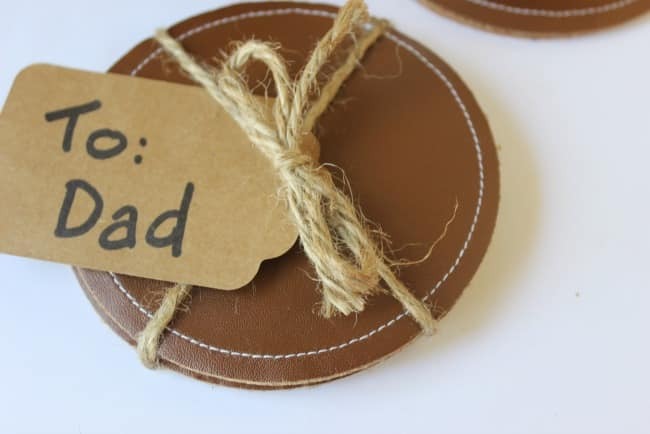 Practicality prompted me to make these easy DIY Coasters with Leather for my husband this Father’s Day. It took me no time at all to make four of these puppies! 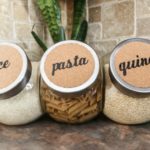 I used cork coasters ($2!) 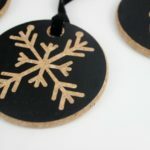 I had purchased from Ikea, but you can also use sheets of cork (like I did in this project) and cut them into circles. To make things a bit easier for you, I shared the whole thing in this two minute video… enjoy! Don’t forget to subscribe to my Youtube channel for more great DIY videos! 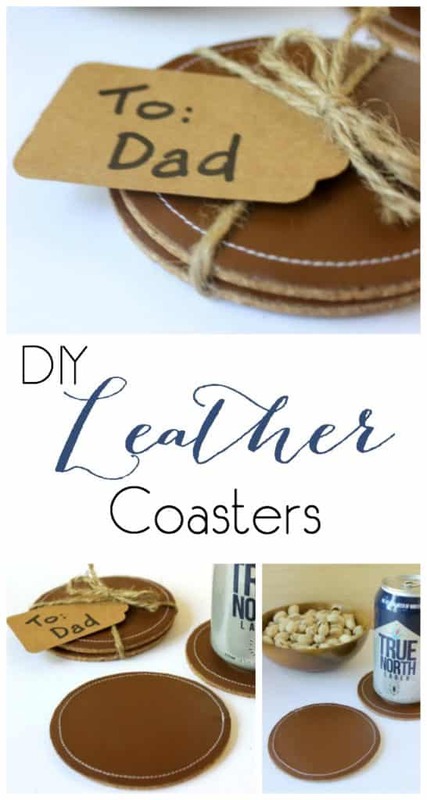 Cut leather to fit coasters. 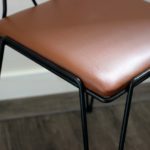 I did this on my Cricut Explore, setting the material to 1.8mm leather. 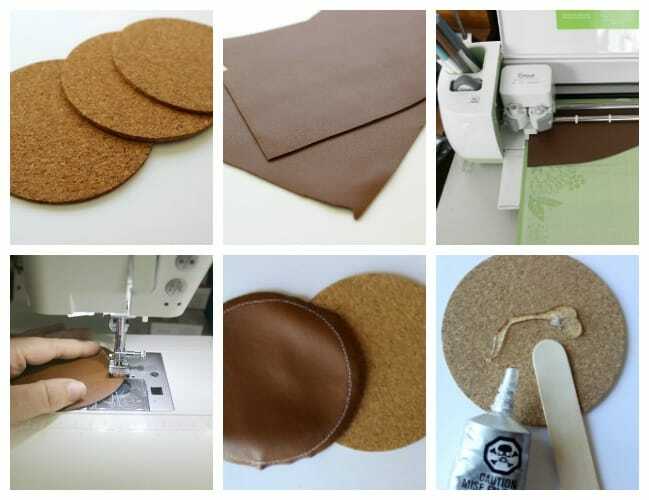 Sewing around the edge of your coaster with a needle and thread or a sewing machine. 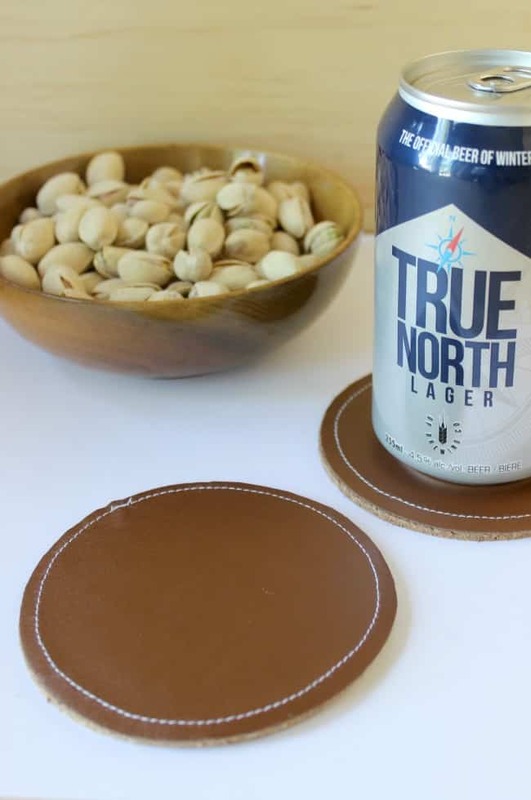 Attach your vinyl or leather to your coaster using E6000. Protect your hands when using this glue – it is VERY sticky. I made four of these in an hour and a bit (plus I video taped it and took pictures!). 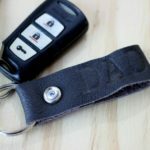 This really is a crazy simple Father’s Day gift that he will actually use. 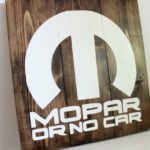 Perfect for the garage or the man cave! 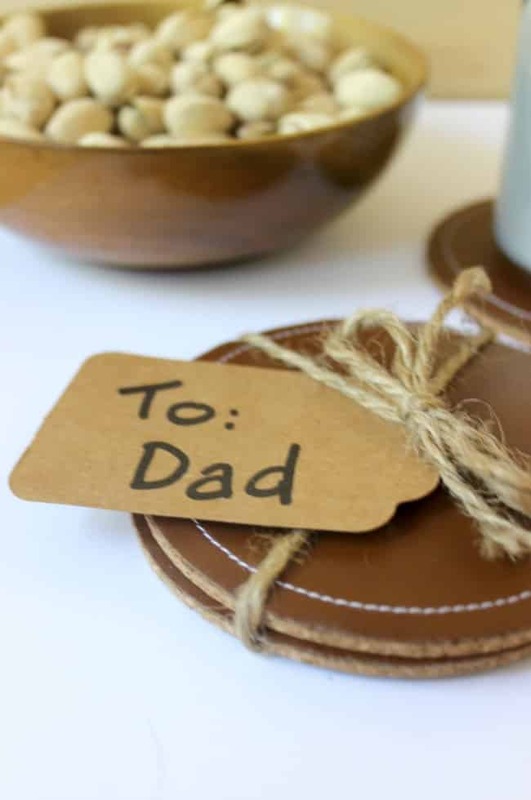 Stick around, I’m sharing two more great Father’s Day gifts on Thursday and Friday too! great idea and with such a beautiful creation! Thank you! I was very happy with how they turned out! Such a practical and nice gift idea. Thank you! Pinned. What a great, personal gift! I might even consider monogramming them. 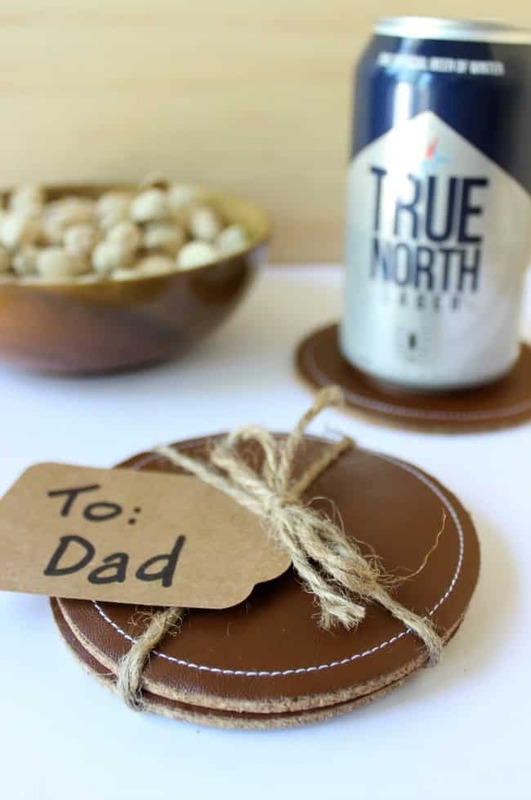 Oh my husband would love these coasters for a Father’s Day gift! I’m a little scared of my sewing machine but I think I could make a decent no sew version. 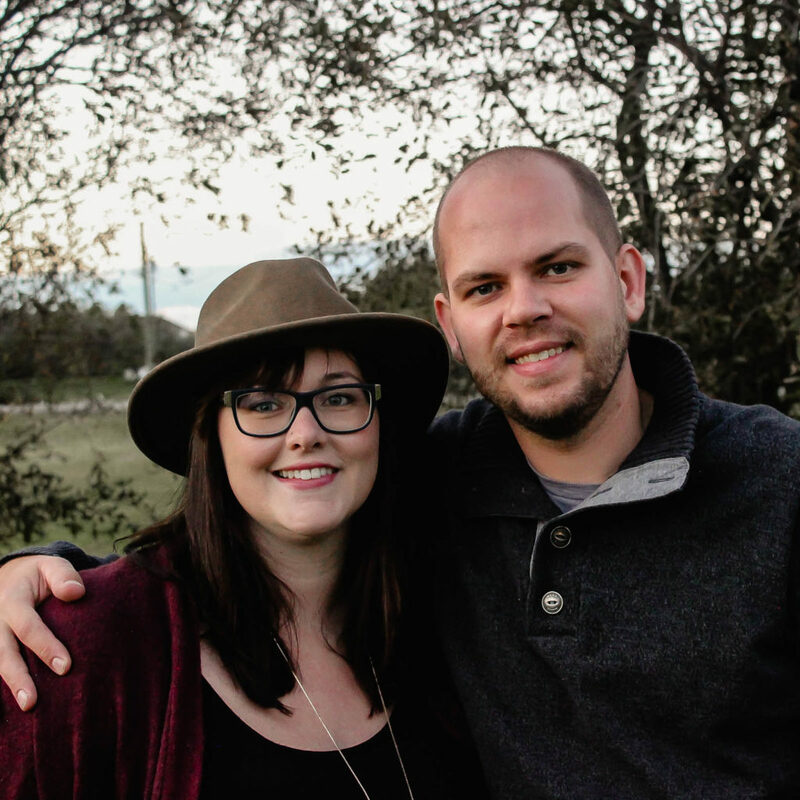 Thanks so much for the inspiration and for sharing at The DIY Collective this week! These are awesome!!! Girl, you are seriously creative!